Auburn's kickoff coverage unit is giving up 25.2 yards per return, putting the Tigers 106th nationally in that category. Gene Chizik said during the weekly SEC teleconference that it's an ongoing concern. Chizik was referring to the long return by Arkansas' Dennis Johnson, which halted the Tigers' second-half momentum after they had scored 20 straight points to pull within 11. Johnson is the top kick returner in the SEC, averaging 33.8 yards per return. 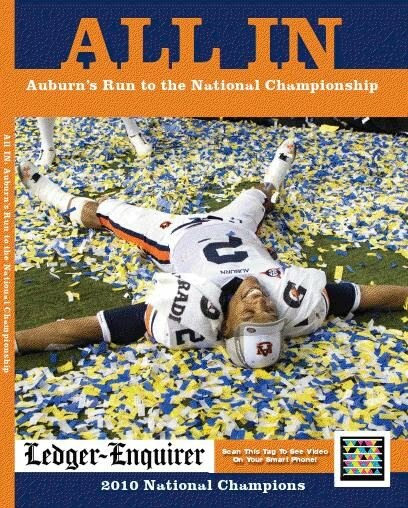 Derrick Locke of Kentucky, Auburn's opponent this week, is No. 2 at 32.1 yards per return. "He brings another element to the table, because not only has he got a lot of speed, he's got great balance," Chizik said. "He's really hard to tackle one-on-one, and when he gets some momentum going down the field, we've got issues. So we've got to really shore our kickoff return game up and not necessarily kick straight to him. We've got to do some things right now to equalize that game, because right now they're really good at it." Chizik said he's not surprised to see what freshman safety Daren Bates has accomplished this year. "He does make some of the freshman mistakes you'd expect anybody to make, but he's stepped up to the plate when we desperately needed somebody to do that at the safety position. And he took the position over. And he's really done a nice job of that, because he's really tried to become a better football player every week. That's really, really what I'm proud of him for. Again, just thrown into the fire and really delivering. And he's got a lot of room to grow to become a better football player. He knows that. We know that. But right now we're really pleased that he's playing the way he's playing." Chizik was asked about Twitter. "The way the day and age is right now, the kids have to understand that they're always being watched," he said. "There are always people that are interested in who they are and what they do and what they say. So to say there's a Twitter policy in place right now, there's none of that. 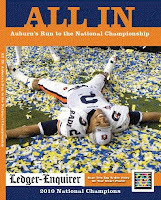 But when it comes to the Facebook and the Twitter and things of that nature, we educate our kids on understanding the importance of being an Auburn man. That's public information. Everybody's going to read it. So they need to understand the confines of our team rules and discussing things about our football team." As for a specific policy, he says there's nothing specific to Twitter that he doesn't expect of his players in any kind of media setting. "Under our policy of just the way we handle the public and the way we handle the media and things of that nature with our kids, they know what our expectation is, and that's to make sure they don't do anything to embarrass or put our football team in jeopardy in any way, shape or form by information that they're giving. If you have a problem, I guess that's when you have to put a specific Twitter policy in place." Kentucky coach Rich Brooks also weighed in on the Twitter craze: "I try to have as few policies as possible. The one policy we have, whether it's Twitter, whether it's Facebook, whether it's My Space, whatever it is in this electronic age, is that you're representing the University of Kentucky, you're representing football and you don't want to have anything on there that is of a confidential nature of is of an embarrassing nature to your team or your university." He added this: "I say it's a problem to say, 'You can't Twitter.' ... If you keep things on above board and treat them pretty much as adults, I think we shouldn't have a major problem moving forward." Brooks said cornerback Paul Warford (quad) practiced today on a limited basis. He didn't know if Warford would be able to play Saturday. He was asked about the challenges of running a football program at a basketball-crazed school and responded like this: "Well, basketball isn't the problem. It's the teams we compete against in football in this conference. Basketball success actually helps us recruit players and bring people in here during December and January on visits and got to Rupp Arena, it's a pretty impressive situation. And certainly with facilities and financial standpoint, we're certainly not treated as second-class citizens here, so I don't think that's a problem at all. ... The problem is getting enough good players to beat Alabama and Florida and LSU and Auburn and Tennessee and South Carolina and those kind of people. That's the challenge we face." With QB Mike Hartline out, Kentucky might have to lean on the running game more. The Wildcats ran for 133 yards against Alabama two weeks ago and 204 against South Carolina last week. But Brooks thinks balance is imperative. "Certainly we want to lean on the running game against Auburn," he said. "If you can't throw it, it's going to be a heck of a lot harder to run it because they pack that box. To me, you have to have somewhat of a balance. Whether it's run first and pass second or pass first and run second, you better be able to do that other one a little bit or the other one isn't going to work once." 1) I'm concerned about our run defense, so knowing UK may have to lean more on running is a little troublesome. 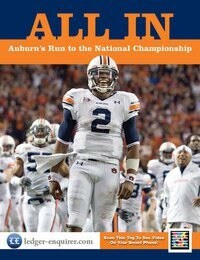 2) I'm not football expert at all, but I wonder why AU has to kick for the #1 and #2 kick returners in the conference. Why can't you just kick the ball to the guy on the other side of the field? Roof will probably bring Ethridge down to stack the box and take away KU's run game. Force the new KU QB (whomever it may be) to beat them by passing the ball.